I am an Auburn Fan. If you have read any of my previous pieces (articles? blogs? posts? What do you call these things, anyway? “Pieces” makes them sound like works of art. Which, of course, they are. I am way too humble to point out this obvious fact, yet there it is. But I digress…), you would certainly know that. My Auburn fandom is hereditary. It is in my DNA, my genes. Just as I got my ears and nose from my dad, so too did I receive from him my allegiance to what I firmly believe is the greatest institute of higher learning on the planet. That allegiance is unwavering. It is non-negotiable. I can no more turn it off or separate myself from it than I can make hair grow on my head (full disclosure: I can’t). This can, from time to time, cause a problem. Well, not so much a problem as a sizable challenge. War Internalize Eagle: This is Rich Perkins, a professional, in the Auburn press box. He looks like this during every play—Auburn touchdowns, Auburn fumbles. It’s screwed up. But it happens. He’s a professional. You see, for a living, I cover and talk about sports. Predominantly Auburn sports. And here, as they say, is the rub. On one hand, my job is perfect! I love sports. I love Auburn. What could be the problem? Just a little thing called “professionalism”, that’s all. You see, for many in my business, what sport you cover, or what team, is a matter of pure business. You work for a paper and you get the Auburn beat. You work at a radio station in Atlanta and cover the Falcons. It’s a job. And if a better opportunity springs up in Ann Arbor or Austin, you pick up and move. No problem. And there is nothing wrong with this. Almost all of the most amazing writers and commentators do this. It is their profession. And that is part of what makes them so good. That objectivity. I really admire that. I admire it but I do not share it. I have tried to come up with scenarios, or magic numbers, that would entice me to pick up and move to cover another team. I just can’t imagine one. It’s like trying to imagine what it would be like if everyone on the planet spoke Whale. It’s just so outside the realm of possibility that I cannot conceive what it might look like. So why does this pose a problem? Well, the standard norms of professionalism (think MLB’s “unwritten rules”) dictate certain behavior in certain places. For the most part, they don’t really affect me. Not because I’m unprofessional (I am) but because what I do falls outside journalism into a gray area called “commentary”. I don’t so much report, as talk about what has been reported. But to do my job, I need to see as many as possible of the events that I will be talking about. Which means rubbing elbows and following the leads of those a fore mentioned professionals. Nowhere is this more difficult than inside the press box at Jordan-Hare Stadium. Allow me to give you an example or two. Not in the press box. Can’t happen. Please don’t misunderstand. I am not complaining! I understand and completely agree with the rules! It just that…well…it’s hard sometimes! Think back to some of the best plays over the last 3-1/2 years in Auburn football alone. Imagine sitting on your hands and biting your tongue until it bleeds so you don’t yell out it agony or ecstasy. Imagine sitting next to one of your close friends and all you can do is share a smile and a raised eyebrow. Tough, huh? But man… it is totally worth it! To be in the press box of every home game, to be around all those men and women who are so good at their jobs. To witness that wonderful machine operate the way it does. To experience on such a level that thing that you love so much. It really is amazing. And you would think that being so close to something you love might take the luster off a bit; reveal some warts. Not to me. If anything this closeness has deepened my affection for my alma mater. My friends who have left Auburn for the suburbs are somewhat in awe of what I do for a living. And frankly, so am I. I will never get wealthy doing what I do. I make a living, thanks to a great employer, but this is a small market and I get an appropriately sized paycheck. But man… the perks! And so, each Saturday I sit in the press box with all the professionals and I cheer. I cheer loudly. In my head. After all, I am an Auburn fan. 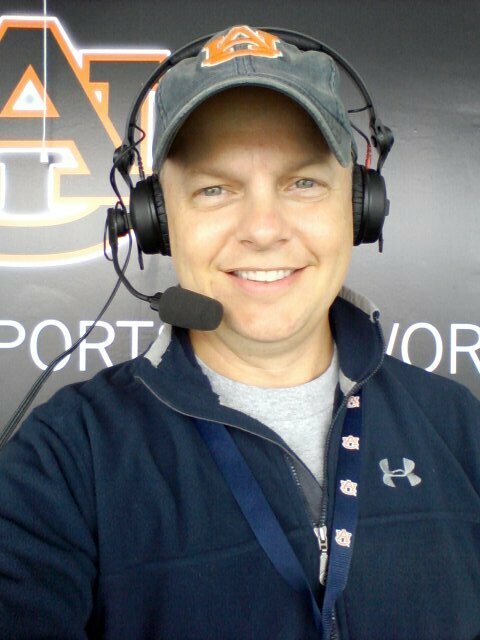 Rich Perkins hosts The Drive, a weekday sports call-in show heard in Auburn on ESPN 106.5 and around the universe at espnau.com. He also has a little blog he occasionally updates with things that mostly amuse only him. Also, he thinks the movie Diner is one of the greatest movies of all time. Don’t ask.